Offered is a marvelous ancient silver drachm coin depicting Hormoizd II, a powerful Sassanian king (302-309 AD) set on a magnificent custom made frame in 24 karat yellow gold (pure gold), making this wonderful pendant an alluring piece of jewelry. The information on the ancient Hormoizd II silver drachm coin is as follow. Bust right, wearing eagle crown with korymbos / Fire altar with ribbon and bust left in flames; flanked by two attendants, the left wearing winged crown, the other wearing mural crown, both with korymbos; two pellets to left of flames. SNS type Ia/3b; Göbl type I/1a; Sunrise 822 var. 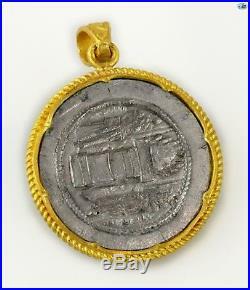 This wonderful custom made 24 K (pure gold) pendant is in excellent condition weighing in total. 17.94 grams and measuring 33 mm x 47 mm with the loop. 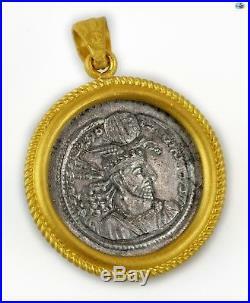 The item "Ancient Genuine Sassanian King Hormoizd Silver Coin Set on 24K Pure Gold Pendant" is in sale since Saturday, August 11, 2018. This item is in the category "Jewelry & Watches\Vintage & Antique Jewelry\Fine\Designer, Signed\Necklaces & Pendants". The seller is "sinasantiques" and is located in Los Gatos, California. This item can be shipped worldwide.